Keep Food Warm and Ready to Serve! Power Cord Length: 3.9' Ft. 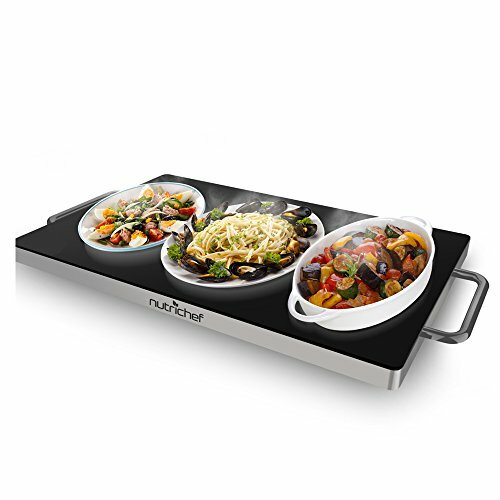 The NutriChef Electronic Warming Tray provides convenient and hassle-free food prep ability. The tabletop design resembles a buffet warming hot plate -- that features sleek stainless steel construction and non-stick, heat-resistant tempered glass. The high-powered heating element heats quickly and the ultra-thin space saving design is safe for placement on any table or counter. Use the warming tray with baking sheets, casserole dishes or just about any other heat-resistant cookware in your kitchen. Heat your food up to 203°F while the cool-touch carry handles allow for safe food transport. Enjoy energy efficient and convenient food prep ability with the NutriChef Electronic Warming Tray.